The Adventures of Sherlock Holmes is the first volume of short stories in Edgar Award winner Leslie S. Klinger's original landmark series. In Adventures Sherlock Holmes tackles some of the most famous cases of his career, including: crossing swords with the beautiful Irene Adler, a Christmas-time jewel theft, and an encounter with "The Speckled Band." 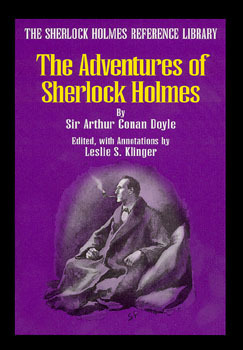 The Adventures of Sherlock Holmes is one volume of The Sherlock Holmes Reference Library, an exhaustively annotated, ten-volume edition of the Sherlock Holmes tales. It's the most complete collection of Sherlockian scholarship and commentary ever assembled. No Sherlockian bookshelf is complete without it. Each illustrated volume is bursting with scholarly annotations and features a sturdy, smythe-sewn soft cover binding.